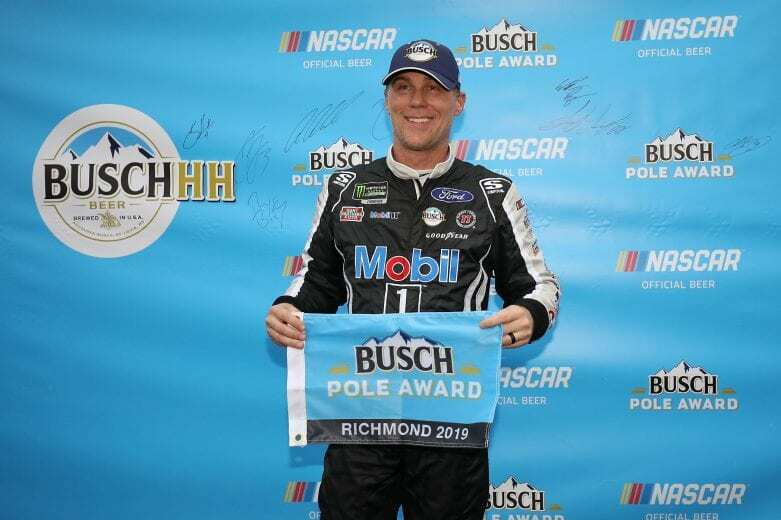 Kevin Harvick(4) won the pole for the first night race of the season at Richmond Raceway. After qualifying Friday the cars were impounded and inspected this morning. The starting grid will be modified significantly when the green flag falls. A total of eight cars failed inspection and will be relegated to the rear of the field. Chase Elliott(9), Aric Almirola(10), Denny Hamlin(11), Erik Jones(20), Matt Tifft(36), Daniel Suarez(41), Jimmie Johnson(48), and Joey Gase(66) all were penalized. 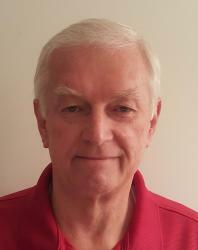 Harvick drove off into the lead as racing from mid-pack on back fanned out two and three wide. Kyle Busch(18) and Kurt Busch(1), the top two cars from last week at Bristol, drove to the front and began eating into Harvick’s lead. NASCAR scheduled a competition caution for Lap 40 due to rains overnight and into the morning. Almost everyone pitted for new tires and fuel. On the restart, Kyle Busch held the lead with Harvick 2nd. Joey Logano(22), Martin Truex Jr.(19), Chris Buescher(37) all moved past Harvick as the race settled into the 100 laps of Stage 1. Kyle Busch held on for the Stage win, easily outrunning Logano in 2nd. The 2nd Stage started almost the way Stage 1 ended with Kyle Busch in the lead and Logano in 2nd. Truex, Harvick, and Bowyer followed to the green flag restart. Kyle Larson(42) cut down a tire 30 laps into the Stage and wrecked out of the race when he hit the wall. 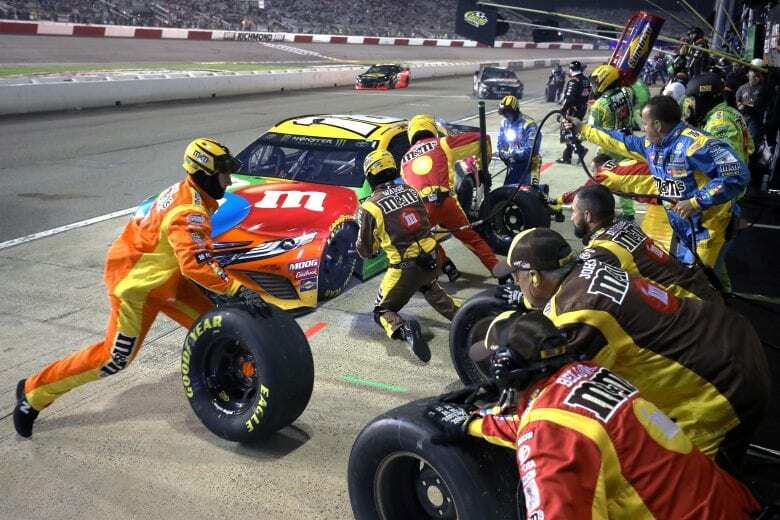 With tire wear such an issue at Richmond, all the leaders pitted. The top five remained the same. But, Kyle Busch was clocked too fast on pit road and sent to the rear of the lead lap, restarting in 24th place. Truex quickly passed Logano and took his turn at the front of the field. Late in the Stage, Logano moved back into the lead passing Truex to take the Stage win. Kyle Busch worked his way up to 15th. Logano and Truex lead the field back to green for the 200 laps of the Final Stage. As the cars settled in after the restart, Brad Keselowski(2), Harvick, and Bowyer filled out the top 5. Kyle Busch managed to work his way back into 10th. On Lap 242, Michael McDowell had a right rear tire give out and he spun crashing into the turn 1 wall. Again all the leaders pitted for tires. Truex took the lead away from Logano exiting the pits first. The remainder of the top 5 stayed the same. Kyle Busch restarted in 7th. Keselowski passed his teammate Logano on the restart and a few laps later passed Truex for the lead. The #2 car stayed out front for 28 laps, then Treux passed to take back the lead. Green flag pit stops began with 80 laps to go. Barring another caution, it should be the final stop of the evening. When the field cycled through their stops, it was Truex back out front increasing his lead to two seconds. Bowyer moved into 2nd, followed by Logano, Harvick, and Hamlin. Kyle Busch, with an uncharacteristic slow stop, dropped back to 10th. Truex has led over 1,300 laps on short tracks but has never posted a win on a track less than a mile in length during his Cup career. With 50 laps to go Bowyer closed the gap behind Truex to less than a second, trying to make the winless streak continue. With 25 laps to go Bowyer had made it to Truex’s bumper. With 22 to go, they were side-by-side but Truex maintained the lead. As the front two battled lap after lap it allowed Logano to close up and join the fight for the lead. With 10 laps to go, Truex had stretched the lead. Bowyer may have used up his tires trying to get by earlier. At 4 to go, Logano passed Bowyer for 2nd. With the white flag in the air, Logano was at Truex’s bumper. Would another bump and run between the two play out the way it did at Martinsville last fall? Truex held on to the win, finally breaking the short-track drought. 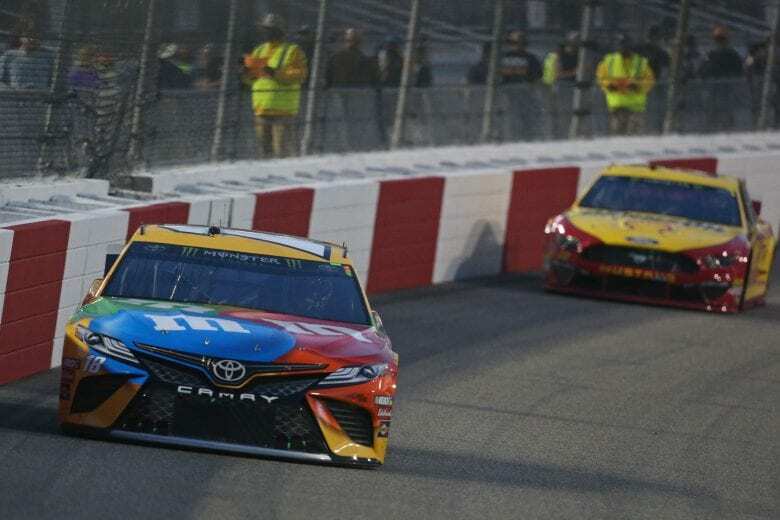 His first win of 2019 and his first win for Joe Gibbs Racing. The Easter break leaves the Cup cars at home next weekend. Then its Talladega on Sunday the 28th as the series moves from the bullrings to the superspeedway.